OPEN ENROLLMENT BEGINS FEBRUARY 20 Portland Parks & Recreation is dedicated to providing a play-based, child-centered educational preschool program for ages 3-5 years old. $35 enrollment fee due at time of registration. Portland Parks Preschool gives priority registration to returning and legacy families. Call your community center for more information. In compliance with Civil Rights laws, it is the policy of the City of Portland that no person shall be excluded from participation in, denied the benefits of, or be subjected to discrimination in any City program, service, or activity on the grounds of race, color, national origin, or disability. To help ensure equal access to City programs, services, and activities, the City of Portland reasonably provides: translation and interpretation services, modifications, accommodations, auxiliary aides and services, and alternative format. • Choose the activity you would like to participate in, and register for that class. • Contact Inclusion Services at 971-284-5060. • If this is your first time requesting accommodations through Inclusion Services, you will need to complete either a phone intake or an Accommodation Form that can be sent over email. This process is to help determine what level of accommodation needed for the participant. • Future assistance will be provided based on need. The inclusion staff will work with the instructor on how to support you and your individual needs. IMPORTANT DETAILS • A general program may be adapted using auxiliary aids and services, but the basic structure of the program remains the same. • Accommodations are made as needed and can be flexible, as well creative. • Participants need to register for activities that are intended for their birth age. • Personal care is provided for activities for individuals up to age 12. • For sign language interpreter please call 2 working days prior to the class • We request at least 10 working days’ notice prior to start of class. If you have questions about Inclusion Services, please contact Lyndsey Goforth at 971-284-5060 (lyndsey.goforth@ portlandoregon.gov). If necessary, use City TTY 503-823-6868, or use Oregon Relay Service: 711. INCLEMENT WEATHER PP&R classes, activities, rentals, and sports events may be canceled due to inclement weather, such as ice, snow, or extreme heat. 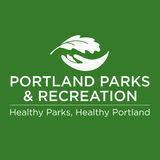 Check with your PP&R facility for the most current information via phone or online at Portlandparks.org. Some recreation programs may run as conditions and staff availability allow. Safety is a major factor in determining operations at each PP&R facility. PP&R facilities, our social media outlets, and our website will all feature operating information including opening and closing times. 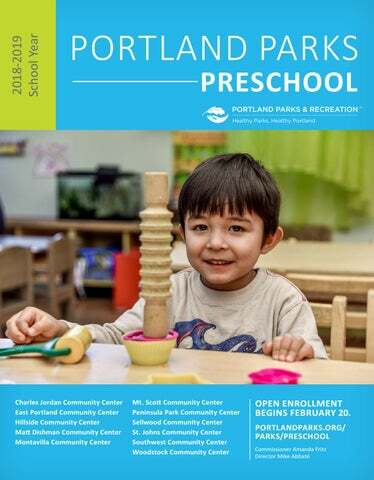 Portland Parks Preschool gives priority registration to returning and legacy families. Enrollment taken in-person only. Please call Hillside Community Center for more information: 503-823-3181. MISSION Portland Parks & Recreation is dedicated to providing a play-based, child-centered educational preschool program for ages 3â&#x20AC;&#x201C;5 years old. Play is an important avenue for learning. It is our goal to honor where each child is in their development and to make goals to foster the individual child's growth and development. It is our belief that ALL children want to be successful; we are committed to providing guidance that supports each child and classroom. CLASS OFFERINGS | HILLSIDE COMMUNITY CENTER Portland Parks Preschool classes run September to June. The total amount for the year has been divided into nine equal monthly payments. What is a Green Preschool? In spring 2010, the Sprout Academy became certified Eco-Healthy by the Oregon Environmental Council. In addition to our green-focused curriculum, the physical environment where our students learn is a healthy setting for their growing minds and bodies. Sprout teachers, the program manager, and SWCC’s building director worked together to bring the classroom setting up to the OEC’s standards for an Eco-Healthy Child Care. From the paint on the walls to the cleaning products we use to the educational materials on the shelves, Sprout Academy is a safe place for your child to learn and play. CLASS OFFERINGS |SOUTHWEST COMMUNITY CENTER Portland Parks Preschool classes run September to June. The total amount for the year has been divided into nine equal monthly payments. Age 3-4 Must be 3 years old by September 1, 2018. Additional $35 enrollment fee due at time of registration. The focus of this program is on learning social and listening skills, beginning language and math concepts, following directions and cooperating with others. Children learn and grow through play and exploration. The Sprout Academy is a school-year long educational preschool program at Southwest Community Center. Our teaching philosophy is children learn through play, infused with hands-on lessons of what it means to be green and how we can each do our part. By being role-models & leading by example, Sprout instructors teach students the importance of reducing, reusing, re-purposing, and recycling as well as simple concepts of sustainability. Students cumulatively build on the lessons they have learned throughout the year and are well-prepared for their next adventure whether it be moving up into Pre-K, or heading off to Kindergarten! SCHOLARSHIPS AND FINANCIAL ASSISTANCE Portland Parks & Recreation recognizes that some residents of the City of Portland may require financial assistance to participate in our programming. We believe all preschool age children should have access to educational opportunities in their community. If the cost of Portland Parks Preschool is out of your reach, we encourage you to speak to our staff about scholarship opportunities that may align the price to your family's budget. CLASS OFFERINGS | CHARLES JORDAN COMMUNITY CENTER Portland Parks Preschool classes run September to June. The total amount for the year has been divided into nine equal monthly payments. CLASS OFFERINGS | MATT DISHMAN COMMUNITY CENTER Portland Parks Preschool classes run September to June. The total amount for the year has been divided into nine equal monthly payments. CLASS OFFERINGS | MONTAVILLA COMMUNITY CENTER Portland Parks Preschool classes run September to June. The total amount for the year has been divided into nine equal monthly payments. Portland Parks Preschool classes run September to June. The total amount for the year has been divided into nine equal monthly payments. Peninsula Park Community Center is dedicated to a multicultural preschool program through intertwining multicultural instruction and activities throughout the daily curriculum. Children are valued for their uniqueness and are taught, through examining other cultures, the importance of diversity in themselves and others. Multiculturalism is reflected in each classroom with toys, music, books, foods, daily activities, and cultural celebrations. CLASS OFFERINGS | ST. JOHNS COMMUNITY CENTER Portland Parks Preschool classes run September to June. The total amount for the year has been divided into nine equal monthly payments. CLASS OFFERINGS | EAST PORTLAND COMMUNITY CENTER Portland Parks Preschool classes run September to June. The total amount for the year has been divided into nine equal monthly payments. CLASS OFFERINGS | MT. SCOTT COMMUNITY CENTER Portland Parks Preschool classes run September to June. The total amount for the year has been divided into nine equal monthly payments. CLASS OFFERINGS | SELLWOOD COMMUNITY CENTER Portland Parks Preschool classes run September to June. The total amount for the year has been divided into nine equal monthly payments. Sellwood Community Center is dedicated to a multicultural preschool program through intertwining multicultural instruction and activities throughout the daily curriculum. Children are valued for their uniqueness and are taught, through examining other cultures, the importance of diversity in themselves and others. Multiculturalism is reflected in each classroom with toys, music, books, foods, daily activities, and cultural celebrations. CLASS OFFERINGS | WOODSTOCK COMMUNITY CENTER Portland Parks Preschool classes run September to June. The total amount for the year has been divided into nine equal monthly payments.